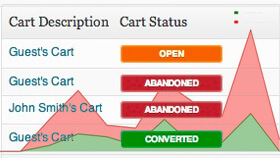 The Shopping Cart Reports app allows you to keep track of Abandoned, Open, and Converted Carts. 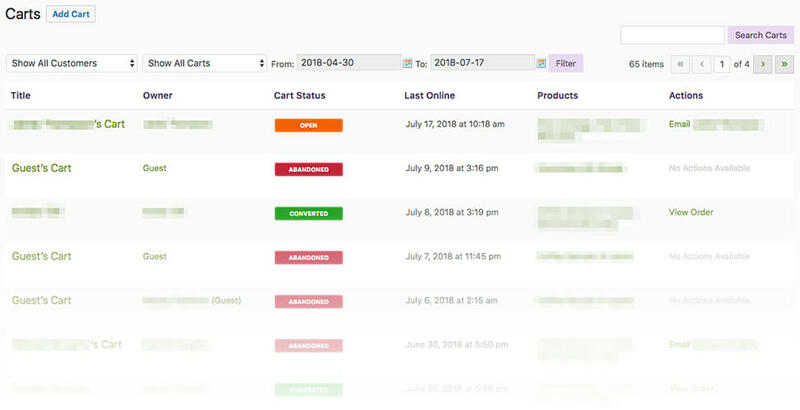 View cart abandonment statistics and graphs from your admin dashboard with real-time metrics on open and abandoned shopping carts from your customers. Keep tabs on customer carts and manage your online store more efficiently. Easy to set up & manage. At-A-Glance Dashboard Widgets for quick-look stats. "Cart Detail" view showing cart products, time-last-updated, and more. Contact customers when they have logged in, but have abandoned their shopping carts - perfect for offering a discount to complete their purchase. Once you've activated the Shopping Cart Reports app in your website admin panel, you can find the settings for the app in a new section under "Settings > Store Settings > General". Abandoned Cart Timeout - Enter the length of time in seconds for user inactivity before a cart should be considered abandoned. Dashboard Widget Time Range - Enter the time-range in days to be displayed on the dashboard's "Recent Cart Activity" widget. Show Products On The Cart Index Page - Checking this option may slow down the table listing when showing many carts at once. 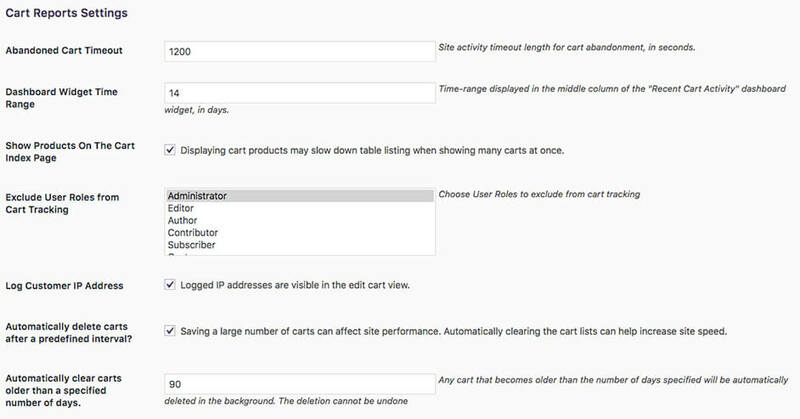 Exclude User Roles From Cart Tracking - Choose user roles that should be excluded from shopping cart tracking. Log Customer IP Addresses - Checking this option will log the customer's IP address so they're visible in the edit cart view. Automatically delete carts after a predefined interval? - Saving a large number of shopping carts can affect site performance. Automatically clearing the shopping cart lists can help increase site speed, and this option is recommended to be enabled. Automatically clear carts older than a specified number of days - Any shopping cart that becomes older than the number of days specified will be automatically deleted in the background. The Shopping Cart Reports app provides 3 easy ways to keep track of how your customers are managing their shopping carts. A Dashboard widget, Cart Table view, and a new Shop Reports tab. The Shopping Cart Reports app adds a new widget to your admin Dashboard which shows the quantity of open and recently abandoned carts. The Cart Table view offers detailed shopping cart information from your store in a list format. The table list view can be accessed under "Users > Shopping Carts" in your admin panel. The Table view allows you to filter shopping carts by date last updated, Cart status (Open, Abandoned, & Converted) and Customer, including Guests, for guest carts. Unless the cart is converted, and contact information has been assigned through the billing fields, guest carts do not contain any contact information, but do contain ip address if the option is selected in the settings. Cart Description - Name of the user who created the cart, or a “Guest” label if no customer information is known. Cart Status - Abandoned, Open, or Converted. Last Online - Shows the date and time the customer last loaded a page on your site with an open shopping cart. Products - Products in the cart. Actions - Available actions for the cart, including "Email Customer" if customer information exists, or "View Order" when viewing a Converted Cart. 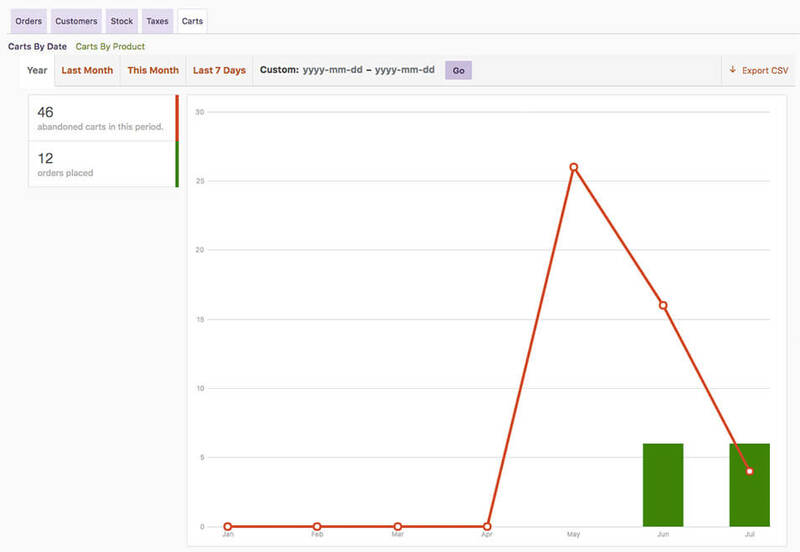 The bulk of the reporting features are located in a new "Carts" tab under "Dashboard > Shop Reports > Carts". Carts By Date - Visualise cart activity in your store by a custom date range to keep tabs on customer trends and activity. Carts By Product - Examine cart activity for individual products, and see how individual items have been abandoned over custom date ranges.